We hosted friends a few weeks ago for dinner, and had such a wonderful time. The littles ones splashed in the pool, the husbands made crisp greyhound cocktails, and we all enjoyed a fabulous dinner, including a special kid-friendly dessert: make-your-own ice cream sundae bar (keep an eye out for a future post on this beloved dessert). Confession #1: the adults might have loved the sundaes just as much as the toddlers! Confession #2: We might have made French fries for the kids and ended up loving those too! It truly was a great night with great friends. So what is the recipe for such a successful evening? Of course you want to put on your hostessing hat (find my dinner party checklist here!) and have your house at its best, a beautifully set table, fresh flowers, candles lit and music playing etc., however I think the two most important factors are excellent food and a relaxed host. Sometimes the latter can be the hardest part, especially when entertaining with spirited children! 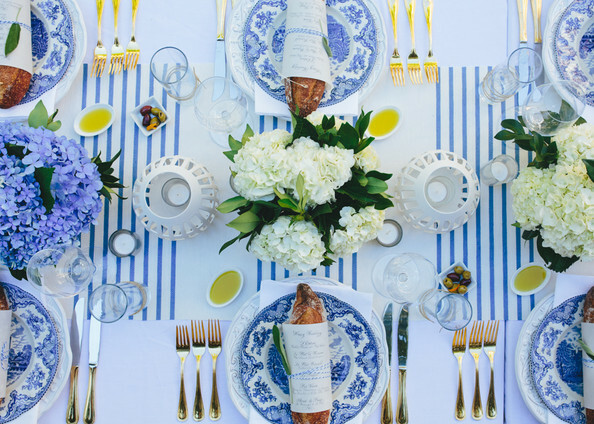 Yet at the end of it all, your guests likely won’t recall if you had hydrangeas or peonies, or the color of the linens, but they will remember the outstanding meal you served, and how much fun they had. As for the relaxed host, try to be as organized as your can and plan ahead, as this will alleviate last-minute stress. Map out your menu, florals, table setting, etc. a couple of weeks ahead. If you prefer to outsource, be sure to line up your caterer and floral arrangements well in advance of your party. Also, make a day-of to-do list so you be sure to remember all of the final details! Now for the food! When entertaining, I gravitate towards simple yet delicious food that is in season, relatively easy to prepare and has fantastic presentation – think an array of vibrant colors, flavors and textures. In the summer, our go to is the grill and typically a yummy fruit dessert. This menu that I have prepared for you is tried and true (and what we served our friends a few weeks ago! ), and one I think you will love. I’ve also listed few tips to keep in mind when you prepare this menu for your family or friends. Enjoy! Greet guests with guacamole and cocktails to set the tone for the night. If you don’t have time to make the guacamole, Whole Foods and other speciality markets often make their own guacamole and it’s a great option. Consider serving your hamburgers on brioche buns (so indulgent! ), and have a platter filled with colorful fixings such as green leaf lettuce or arugula, sliced red and yellow tomatoes, purple onions, etc. Be sure to also offer cheese (cheddar or Gruyère) on the hamburgers. If you or your guests don’t eat red meat, you could easily make turkey burgers or even veggie burgers. Dress your salad with a simple balsamic or lemon vinaigrette. Serve the crisp warm with ice cream.